David Regal, when he isn't writing for television shows like Rugrats and Everybody Loves Raymond, creates diabolical magic. And, on these three new DVD's David performs and then teaches killer effects from his Magic Castle act as well as the bestselling books Close-Up & Personal, Star Quality and the forthcoming Constant Fooling. 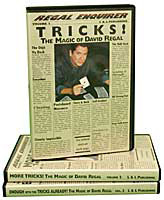 The 36 close-up items taught on these three DVD's are capable of fooling well-posted magicians, yet are exceedingly entertaining to laypeople. What's more, because of David's singular and sometimes unusual methodology, almost all of the effects are surprisingly easy to perform. First, you'll be entertained and fooled along with the studio audience and then delighted as David takes you behind the scenes and shows you the extremely clever workings of his magic. More amazing than an Elvis sighting, these three new DVD's are your chance to get really close-up and personal with the star-quality magic of David Regal. Volume Three - Enough with the Tricks Already!